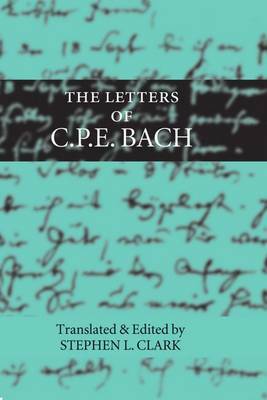 The Letters of C.P.E Bach is the first complete edition of the letters to appear in a single volume in any language. Very few of the letters have appeared previously in English translation. Bach's letters are arguably the most significant extant collection by an eighteenth-century composer, with the notable exception of Mozart's. They give a fascinating picture of the most famous son of J.S. Bach hard at work publishing his own music, debating aesthetic matters, and championing the music and teachings of his father. Most of the letters date from the last twenty years of Bach's life when he was working as music director of the five main churches in Hamburg. Almost 80% are addressed to five people: his printer in Leipzig, Johann Gottlob Immanuel Breitkopf; his friend and agent in Goettingen, Johann Nikolaus Forkel; the Viennese music publisher, Artaria; the Schwerin organist and collector of Bach's music, Johann Jacob Heinrich Westphal; and Georg Philipp Telemann's grandson, Georg Michael, who served as one of the interim music directors in Hamburg before Bach's arrival. The literary personalities including Charles Burney, Karl Wilhelm Ramler, Heinrich Wilhelm von Gerstenberg, Johann Kaspar Lavater, and Johann Joachim Eschenburg. The letters fall into three phases. In the first period, Bach is learning and struggling with his his new responsibilities in Hamburg. The second and largest phase begins in 1773 and is dominated by the collaboration between Bach, as publisher of his own works, and Breitkopf, as printer of those works. The third period is characterized by Bach's painstaking final preparations of his estate and legacy during the last two years of his life. Bach's short transactional letters, chronicling his day-to-day business affairs, are balanced by longer, reflective ones that reveal more of Bachs personality and opinions than previous interpretations have suggested. ...a fascinating insight into the precarious business of musical publication in late eighteenth-century Germany. - Joachim Whaley. British Journal for 18th C Studies. Vol 21 1998.